As a Daytona Beach Yoga teacher – I like to keep a healthy diet plan. Nutrition is a vital asset to furthering your skills in yoga. I have studied and researched many different nutritional supplements. Almost all of them have some sort of fillers or additives that can be unhealthy in the long run. Fortunately – I came across Garden of Life based out of West Palm Beach, Florida. They have a number of organic all natural vegan products that I love. Not only have I noticed results since I’ve started taking Garden of Life products, other people are noticing the results on me too. I’ve lost a few pounds and been successful at keeping the weight off. Besides my vigorous exercise routine I’ve incorporated numerous Garden of Life products into my regimented diet. Each day I start with a nutritious smoothie for breakfast. My favorite meal replacement smoothie is the beyond organic RAW Meal from Garden of Life. It must be other people’s favorite too because it was the #1 selling Meal Replacement according to SPINSscan Natural. RAW Meal provides the nutrition of a well-balanced, healthy raw meal in one delicious serving, and is suitable for almost anyone including those on vegetarian or vegan diets, those on low carbohydrate diets or those with gastrointestinal sensitivities to milk, whey, or other protein sources. This product has..
Garden of Life’s RAW Meal is a high protein, high fiber, certified organic, RAW Meal replacement powder that provides the nutrition of a well-balanced, healthy meal in one serving. RAW meal contains 26 RAW, organic superfoods including sprouts, seeds, greens and fruits plus probiotics and enzymes for healthy digestion. RAW Meal is naturally filling, satisfies hunger, provides energy and supports healthy weight loss when used in place of a meal as part of a balanced diet plan. Manufacturing plant-based protein and green powders required using large amounts of grains and grasses. If they are not organic, unnecessary synthetic pesticides, fungicides and herbicides may be introduced to the diet. Garden of Life’s commitment to offer only the finest, pure, non-GMO ingredients in RAW Meal is evidenced by the rigorous standards, regulations, and procedures that must be upheld to carry the USDA certified organic seal. The protein source is the Organic RAW Sprout Blend composed of 13 seeds, grains and legumes, featuring organic sprouted brown rice. Sprouts are rich in energy, vitamins, minerals, amino acids, proteins, beneficial enzymes and phytochemicals, as these are necessary for a germinating plant to grow. Sprouting increases plant enzyme content, protein quality, crude fiber content, essential fatty acids, chelation of minerals and vitamin content. Unlike many other vegetarian protein sources, Garden of Life’s organic sprout blend featuring whole grain brown rice offers a complete source of protein – 34g per serving – with a balanced amino acid profile, comparable to animal protein sources. 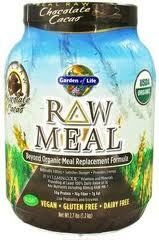 RAW Meal is an excellent source of soluble and insoluble fiber, providing 9g per serving or 36% of the Daily Value. 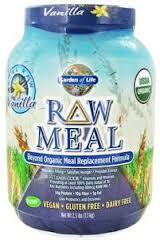 RAW Meal includes RAW fiber derived from organic RAW flax, organic RAW coconut and 13 organic RAW sprouts. As a super-concentrated source of nutrition, RAW Meal is an excellent source of 20 Vitamin code RAW whole food vitamins and minerals, providing at Least 100% Daily Value of 16 Key Nutrients. RAW Meal includes the probiotic Bacillus coagulans and 17 different digestive enzymes to support healthy digestion. RAW Meal also includes the RAW Green Food and Fruit Blend composed of four organic cereal grass juices that provide power-packed nutrition; two microalgae (spirulina and high protein chlorella); plus five organic fruits and berries. RAW Meal is great for those who wish to support healthy weight loss using RAW Meal in place of a meal, and those seeking a RAW convenient meal-on-the-go. It is suitable for almost anyone including those on vegetarian or vegan diets, those on low carbohydrate diets or those with gastrointestinal sensitivities to milk, whey or other protein sources. After a year of research and development. Garden of life is excited to announce new flavors for RAW Protein, RAW Meal and Perfect Food RAW. Both RAW Protein and RAW Meal now come in REAL RAW Chocolate and Cacao and Real RAW Vanilla. Perfect Food RAW is now available in Real RAW Chocolate Cacao.